Auto computer vision startup Nexar Ltd. announced Wednesday it completed a $30 million financing round led by U.S.-based investment firm Ibex Investors LLC., with participation from Alibaba Innovation Ventures, the venture arm of Alibaba, and U.S.-based insurer Nationwide Mutual Insurance Company. Previous investors Aleph Venture Capital, Mosaic Ventures, Slow Ventures, True Ventures, and Tusk Ventures also participated in the round. Founded in 2015 and headquartered in Tel Aviv, with additional offices in New York, San Francisco, and Las Vegas, Nexar develops machine vision-based tools designed to collect data and make driving safer. 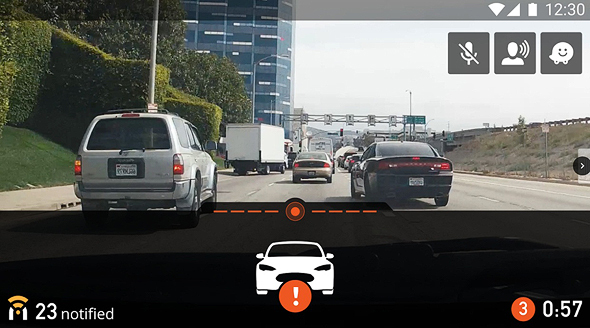 The company launched a free dashcam application in 2016, which connects to a vehicle-to-vehicle network. Since then, drivers in 740 cities across 160 countries have covered more than 100 million miles while generating user-data through the Nexar app, the company said, adding that in the past month alone, Nexar covered 10 million miles. Nexar’s biggest markets are in New York City, San Francisco, Tel Aviv, and Las Vegas. In New York, Nexar is used by more than 10% of the city’s ride-sharing drivers and can provide a complete scan of each intersection in Manhattan every five minutes, the company said. By connecting user-generated data, with information from car cameras and sensors, Nexar can warn drivers of real-time road hazards and prevent collisions. Nexar markets its products to the automotive and insurance industries, and to private users. The company employs a team of 50 in its offices in Tel Aviv and the U.S. In a statement, Nexar said it will use the funding to expand its vehicle-to-vehicle network by working with insurers, cities, and automakers. “By crowdsourcing real-world driving data from vehicles on the road in real-time, Nexar is keeping every vehicle safe on the road and is building the future traffic management system of our roads,” Elan Zivotofsky, Partner at Ibex Israel Fund, said in a statement. Mr. Zivotofsky will join Nexar’s board of directors. Nexar also announced the appointment of Yoad Shraybom to the role of CFO. Mr. Shraybom is the former CFO of The Walt Disney company in Israel, Turkey and Greece. Nexar appointed Marc Gaffan to the role of chief business officer. Mr. Gaffan is the former co-founder of cloud-based application delivery platform Incapsula.